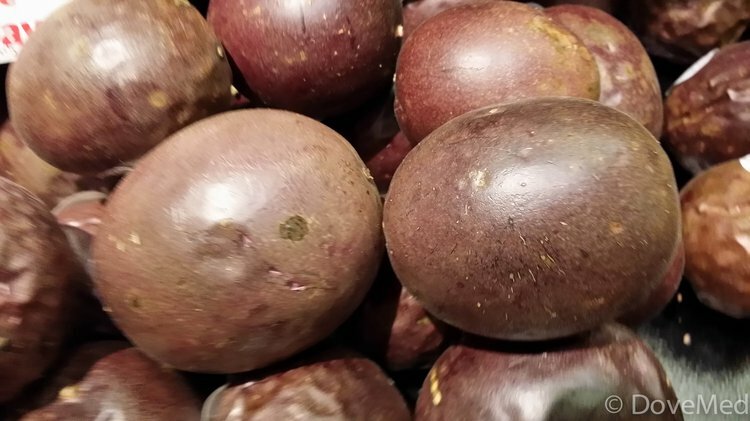 Passion fruit (Passiflora edulis) or purple granadilla is a vine species of passion flower that is native to Brazil, Paraguay, and northern Argentina. Currently, the fruit is cultivated in many regions of South America, Central America, the Caribbean, Africa, Southern Asia, Israel, Australia, and the United States. Passion fruit (Passiflora edulis) or purple granadilla is a vine species of passion flower that is native to Brazil, Paraguay, and northern Argentina. Currently, the fruit is cultivated in many regions of South America, Central America, the Caribbean, Africa, Southern Asia, Israel, Australia, and the United States. This sweet, seedy fruit is round to oval with a soft to firm, juicy interior filled with numerous seeds. It can be eaten and juiced with other fruits to add an aroma. Here are 7 health benefits of passion fruit. 1. Passion fruit can help improve digestive health. Passion fruit contains a significant amount of dietary fiber with 25 grams per cup. The daily recommended dietary fiber intake for men and women are 38 grams and 25 grams, respectively. Dietary may help prevent constipation with water, making one’s bowel movement easier to manage. Dietary fiber can also scrape cholesterol out of the arteries and blood vessels. 2. Passion fruit has a lower glycemic index value. Foods high on the glycemic index like white rice and white bread will break down easily and cause blood sugar and insulin level spikes after meals, which is followed by rapidly dropping blood sugar levels. The sugar from passion fruit is slowly absorbed into the bloodstream, which prevents sugar crashes, sugar cravings, and mood swings. 3. Passion fruit can help individuals fight infections. One cup of passion fruit contains 118 percent of the vitamin C daily requirements. Vitamin C is a potent natural water-soluble antioxidant that helps the body develop resistance against infectious agents and eliminates cancer-causing free radicals in the body. 4. Passion fruit can contribute to maintaining a healthy blood pressure. Passion fruit is loaded with potassium and a low content of sodium. They are well known because of its high potassium content. This helps the blood vessels relax and maintains proper blood pressure. Also, a high potassium diet reduces strain on the heart and increases overall cardiovascular health. One cup of passion fruit contains 821 milligrams of potassium, compared to 66 milligrams of sodium. 5. Passion fruit can help improve the heart’s health. Fiber, vitamin C, and B6, and potassium have been known to improve the heart’s health. The recommended 4,700 mg of potassium is not obtained by many individuals in the United States, according to the National Health and Nutrition Examination Survey, despite the benefits of increased potassium intake. One study suggested that people who consumed 4,069 mg of potassium per day had a 49 percent lower risk of death from ischemic heart disease compared with those who consumed less potassium approximately 1,000 mg per day. 6. Passion fruit may help decrease the risk of cognitive decline. Several components of passion fruit, such as potassium, folate, and various antioxidants are known to provide neurological benefits. Folate has been known to reduce the occurrence of Alzheimer’s disease and cognitive decline. Potassium has been linked to increased blood flow to the brain and enhanced cognition, concentration, and neural activity. Also, passion fruit contains a considerable amount of vitamin B6. A deficiency has shown depression and nausea. Be sure not to consume too much. The vitamin B6 upper limit is set to 100 milligrams for adults over the age of 18, but adults do not need that much unless directed by the healthcare professional. The passion fruit can help an individual sleep with its high content of magnesium, which is a mineral that is directly linked to improving the quality, duration, and tranquility of sleep. Passion fruit also helps regulate the metabolism, to help reduce sleep disorders and the occurrence of insomnia. Evert, A. B., Boucher, J. L., Cypress, M., Dunbar, S. A., Franz, M. J., Mayer-Davis, E. J., ... & Yancy, W. S. (2014). Nutrition therapy recommendations for the management of adults with diabetes. Diabetes care, 37(Supplement 1), S120-S143.